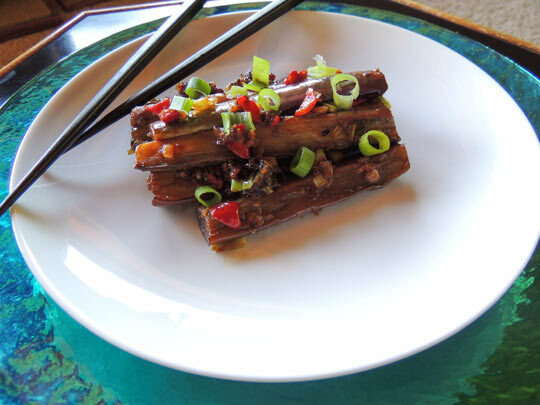 Tender eggplant is dressed in a Chinese-inspired sauce with fresh red chili peppers and garlic, creating a delectable, low-carbohydrate dish. Serve with stir-fried zucchini noodles or grilled salmon. Mix together soy sauce, black vinegar, oyster sauce and brown sugar in a small bowl. Set aside. Heat three tablespoons of the oil in a wok over high heat. Add the eggplant, arranging in a single layer. Flip continuously to cook the pieces evenly, up to 1 minute on each side. Eggplant should start to turn translucent and sticky brown on the outsides. Remove from wok, and set aside. Tip: The strips of eggplant may cook at different speeds. Remove each strip when finished and place in a dish so that they do not overcook and stick to the wok. Add remaining tablespoon of oil to wok along with garlic, ginger, chili pepper and scallions. Stir fry the aromatics, pepper and scallions until fragrant, about 30-60 seconds. Place eggplant back into wok. Pour sauce over all ingredients and toss to coat. Serve immediately with your steamed white rice for a complete entrée, or on its own as a tasty side dish.